Something that I probably can’t stand the most is when people make judgments about another person simply based on his/her skin color, ethnicity, religious background, gender, sexual orientation, etc. When we are young, we are taught to never judge someone based on these things, and yet all you need to do is turn on the news to see grown adults making ridiculous generalizations about an entire group of people. But it’s not just in the media, it’s in our workplaces, our class rooms, our communities, and especially here on the blogosphere. It hurts me even more when my friends are on the receiving end of personal attacks from people who behave as if they know all the facts on things such as feminism and religion. I have been reading many personal attacks on Muslim feminists lately — certain people are saying that one cannot be Muslim and feminist because Islam is such an “oppressive” and “misogynistic” religion. First, it’s ridiculous how they project their hateful and negative sentiments about Islam onto the author(s) and make personal attacks against her/him, as if they have some authority on declaring who can be a feminist or not. Second, it’s absurd how they speak of Islam in this manner without considering that there are millions of Muslims all over the world who follow it devoutly. Thirdly, it’s insulting how their extremely childish and immature behavior makes them believe they’re making scholarly and educated statements when in actuality, all they’re doing is promoting ignorance and intolerance. It’s as if they want to exclude the views of Muslim feminists and not even bother reading what they wrote. In their mind, it seems like there is only one set kind of feminism, and the notion of a Muslim feminist is completely incompatible with their definition. Rather than having intelligent discussions, they’ll make pathetic personal attacks, very similar to how a high school bully picks on someone different than him/her just to boost his/her low self esteem. If someone doesn’t make any personal attacks against you, then why in the world would you make personal attacks and insults against them on your blog? They’re not wishing death upon people or calling for violent rebellions or anything, so why are you making personal attacks when you don’t even know them? It is really unfair for those individuals who are getting misjudged and attacked. What disgusts me even more are the two-faced bloggers out there who will post nice comments on an article written by a Muslim feminist, but then go to another blog and talk smack about her/him. On one blog, they say it feels like their favorite feminist magazine got “hijacked” just because it defended the hijaab as a choice and then they call a Muslim feminist blog “ignorant” and unqualified for being “feminism.” Yet, when these Muslim feminists post their articles, these same bloggers will behave all “nice” and “respectful” to them. I remember an Iranian Muslim feminist who once said about the Iraq war: “If a man rapes me, I don’t want his help later.” If you think you have the absolute and unalterable definition of feminism and that Muslim feminists do not fit in that little box of yours, then why do you persist with fake “polite” comments? Are people really not ashamed of themselves when they behave in this manner? I’ve seen this kind of behavior in high school, I wouldn’t expect it from self-proclaimed feminists. Some of these critics devote all their time to “exposing Islam” as a “violent” and “oppressive” religion. Whenever you try to explain to them that Islam is a peaceful religion, some of them will respond with links and reports of atrocious and violent acts committed by Muslim in Muslim countries, while others will respond more antagonistically and even curse you out: “stop telling me Islam is peaceful. We don’t buy it!” One person even told me that I’m insulting them every day in my prayers because I’m denying the “sonship and divinity” of Jesus, peace be upon him! That’s my cue for stopping the conversation immediately because it’s just a serious waste of time. It’s sad at how some of these people build a wall against you — they don’t want to look at you as an individual, they are looking at your label. Even if you speak about how Islam has changed and impacted your life for the better, they will still pull out those links and point fingers at what other Muslims are doing. Some will even sub-categorize you and say, “oh well you’re one of those ‘good’ and ‘liberal-minded’ Muslims” which pretty much says that you represent the “minority” in their mind, therefore your words aren’t really worth anything. In actuality however, the majority of Muslims are peaceful and friendly human beings. For me, I would never insult another religion or an entire group of people and I just find it really disturbing how they are people out there who actually don’t see anything wrong with doing that. If you hate the religion of Islam and you meet a Muslim in public, are you going to speak to him/her as an individual or are you going to speak to the stereotype? In social psychology, we use the term “ambivalent racism” for people who will show respect and affection to those outside of their group affiliation, but deep down, they will still carry those prejudices and perceptions that the person is a “heretic” or “deviant” or even “inferior.” I’m sick of people saying they hate Islam, but don’t hate Muslims because their “argument” is that good Muslims aren’t truly practicing Islam, since of course Islam is “inherently violent.” Again, these are faulty generalizations and false assumptions about people. It’s also insulting because it suggests that Muslims are brainwashed and oblivious to how their religion “truly” is. When they make these kind of remarks, it makes me want to ask: How do you know that the person you’re criticizing doesn’t know everything about Islam? Or let me frame it this way: How do you know that you know everything about Islam? Sure, there are apostates, where most Islamophobes like to get their “information” from, but just because someone is an apostate doesn’t mean they are experts on Islam. Wanting to “learn” about Islam from them is just pretty much saying that you want a negative (sometimes severely negative) lesson on Islam. If I wanted to learn more about Judaism, I will speak to someone who truly practices it and follows that path, not from someone who is an ex-Jew. You cannot deny the experiences that a person has with his/her religion just because you don’t believe in it. The majority of Muslims find peace and beauty in Islam — it is a source of strength, Love, and wisdom for them. I have friends who have left Islam, and they are living their lives peacefully and happily, they even still have Muslim friends. They don’t devote their time spreading hatred about it, but unfortunately there are those who think they need to do that. But I ask, as a human being, how is marginalizing and vilifying an entire religion going to help make a better society? I truly believe every religion essentially teaches us to be good human beings. The violence and oppression committed in the name of religion is a very complex issue and it cannot be simplified the way that many Islamophobes simplify it. Without understanding factors such as culture, tradition, politics, history, theology, etc., it’s very difficult to not generalize about people. I’ve explained what cultural responses are in my entry, “Jerusalem Cries for Peace,” and how violence and radicalism only escalates after foreign invaders bomb another country. It’s not about forgiving, it’s about understanding. And understanding is something we do very little of. We as human beings need to make this world a better place, we need to promote more understanding, communication, and dialogue. Saying that one group of people or one religion is the problem is not going to solve anything. It will only crumble your relations with other human beings. The Truth is there is no need for separation. The differences we see between one another is, like any other form of division, merely an illusion of the outward reality. Some of us are too stuck in our belief systems that we forget the purely spiritual foundation of our faiths. Whether you speak of Moses, Jesus, Muhammad, or Buddha (peace upon them all), their experience with the Divine is what unites their Souls. These enlightened human beings shared something in common, they were all revolutionists and fought in the battle against the selfish, material world, in order to bring people to the World of the Unseen. Just because we have different beliefs doesn’t mean we cannot get along. It doesn’t mean we have to resort to personal insults and false accusations. It doesn’t mean we can vilify an entire religion and group of people. What is wrong with accepting people for who they are? Isn’t that what Love is? Accepting people for who they are, not for who we want them to be? Those guided well on their paths should not point fingers and criticize another person simply because he/she is following a different religion. Hatred and over-generalizations towards an entire group of people reflects insecurity within one’s self. The flaws we see within others are merely flaws you see within ourselves. The journey of a human being is one of Expansiveness, of Growing, of Compassion, and Self-Discovery. When we achieve this, we become Loving towards those around us, we become tolerant and accepting. Open-mindedness is not being exclusive to one group of people or one way of thinking, but rather it is learning the ability to open your heart and become a Compassionate, Expansive, and Loving human being. When you understand this, you will discover a portion within yourself that you may have never known existed. There will be no conflict between your beliefs and other people’s beliefs anymore. Let people ~Be~ Happiness and peace never hurt anyone. Feminism is a social poison. Bunch ladies who are big losers and mentally ill who didn’t get enough attention in their life. That’s a really wild generalization you’re making. And your opinion is quite insulting too. Feminists take a stand for women’s rights and they speak out against misogyny in all societies so that we can learn how to treat one another equally and respectfully. It seems you have a misunderstanding of what feminism is. And my post is about how I strongly dislike it when people make personal attacks on other individuals or groups of people. You are making those generalizations that I strongly spoke out against in this entry. 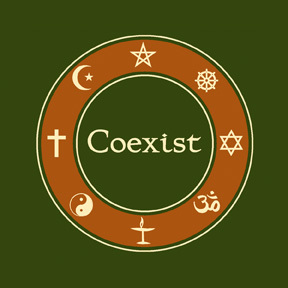 I am huge fan of coexist even in larger meaning for that I can’t agree with whyamisuni. I can’t understand why so much hatered in people and narrow minded attitude. WE ARE ALL THE Same, created by same God, born and going to die one day, and nothing and noone can change it. I can’t understand people that critisize and differ among each other- it’s childish. there’s one life and one world for all of us, the sooner we get to understand it, the better. we should get united with Love not led by ignorance. Thanks for your support, Amina. I agree with everything you said. We are all the same and we come from the same Source. I recently found your blog, and I must say your writings are intelligent and illuminating. And i agree with what you’re saying in this post. All too often, people try to marginalise feminists and other progressive muslims by saying that they can’t possibly be ‘real’ muslims, because they’ve deiced that the only ‘true’ representation of islam is the suicide bomber, and they’ve decided that traditionel islamic women’s wear is ‘opressive’ – this really gets on my nerves, and I’m not even af muslim! So I can only imagine how annoying and hurtful it must be to be lectured about your religion in that manner by an ignorant with very limited understanding of islam and islamic countries. It’s so stupid really – for all those of us who have genuine concers about the positions of muslim women, it’s unfuriating to see how all this chauvanist bigotry blocks for progress and understanding of how complex islam really is. So yeah, you have my support too 🙂 . Salaam alaykum, good for you sister! I have also read sneering comments from Western non-Muslim feminists about Muslim feminists. Claim your space! Wa alaykoum salaam Rayhana 🙂 Thanks! I’m a guy, by the way lol.